California has spent two times more on subsidies for solar than nuclear, measured on a per-kilowatt basis, according to a new Breakthrough analysis. 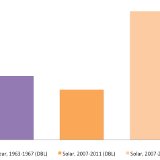 The finding challenges a new analysis from DBL investors, which compares nuclear to solar subsidies without accounting for the fact that nuclear generates far more electricity than solar. Comparing subsidies on a dollar-per-kWh basis is more appropriate because it gives a sense of relative effectiveness of subsidies at providing services to society, in this case electricity provision. Using DBL’s subsidy estimates, the cost-per-kWh of nuclear power and distributed solar in California between 1963-1967 and 2007-2011, is 60 cents and 48 cents, respectively. Using a more appropriate subsidy estimate, however, Breakthrough found the cost-per-kWh of distributed solar over 2007-2011 is 1.2 dollars, two times greater than nuclear. Using DBL’s subsidy estimates, the cost-per-kWh of recent nuclear power generation (2007-2011) is about a tenth of a cent (not included in graph). The DBL report finds that for the first five years of commercial nuclear operation in California, 1963-1967, generators received about $1.85 billion in subsidies (2012 dollars), compared to the $1.7 billion (2012 dollars) that distributed solar generation received between 2007 and 2011. Even though nuclear only received $150 million more, the authors strangely conclude that nuclear received four times the subsidy.1 Based on these results the report concludes that policy should be doing more for distributed renewable energy. One of the troubling aspects of the report is its unequal treatment of nuclear subsidies and distributed solar subsidies. While the report includes comprehensive estimates of nuclear subsidies (R&D, regulatory costs, costs associated with the federal Price-Anderson Act, and costs associated with decommissioning trust funds), it does not include comprehensive subsidies for distributed solar. 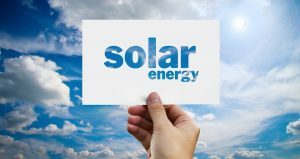 For solar, DBL calculates the cost of the federal Investment Tax Credit (ITC) and the Section 1603 cash grant program, but leaves out R&D and expenditures made through California’s Go Solar Program. Over 2007-2011 the Department of Energy spent about $1.1 billion on solar technologies,2 and we estimate that California spent at least $1.5 billion through the Go Solar Program over this period.3 These two additional subsidies would bring the authors’ total subsidy estimate to $4.3 billion over the five-year period, or 1.2 dollars-per-kWh. There is debate over the appropriateness of “net metering,” where residential solar owners in California receive retail reimbursement rates for electricity supplied back to the grid. Regardless, there are distribution and balancing costs associated with net metering which are borne by non-solar ratepayers, undoubtedly amounting to another layer of subsidization for distributed solar. Finally, the authors compare apples to oranges by looking at the first five years of commercial nuclear power in California (1963-1967) and five recent years of solar generation (2007-2011). To do a true apples-to-apples comparison the authors should have compared the first five years of nuclear generation to the first five years of substantial solar PV generation in California (1989-1994). Doing so would significantly change the result. The function of various “subsidies” is also ignored. While solar subsidies like the 1603 grants, the ITC, and the Go Solar program are designed to lower the purchase price of solar-generated electricity, subsidies for nuclear are primarily related to R&D (which the authors ignore for solar) and liability insurance, which is common for large, capital-intensive technologies (airlines receive “subsidies” similar to the Price Anderson Act, for instance). And as we have documented previously, unique costs to nuclear power like plant decommissioning and liability indemnification amount to a mere $0.001 and $0.0003 per kWh, respectively. We agree with several of the authors’ conclusions, especially that technology subsidies are crucial and beneficial for emerging forms of alternative energy, and that in the long term subsidies should be phased out. Unfortunately, the comparisons made in the DBL report tell us very little about the ideal form or function of technology subsidies and investments. Their methodology relies on cherry-picked data and arbitrary parameters, perpetuating the illusion that distributed solar represents a complete alternative to centralized power production. Our findings show that nuclear subsidies have provided a relatively cost effective means of providing electricity to Californians and that nuclear power has a vital role to play in providing clean, cheap, reliable electricity. 1. Pfund, N. E. and N. W. Walker, “Ask Saint Onofrio: Finding What Has Been Lost in A Tale of Two Energy Sources,” DBL Investors, August 2013. See Chart 1 (page 4): “California’s Share of Federal Subsidies: Nuclear (1963-1967) and Solar (2007-2011). 2. Gallagher, K. S. and L. D. Anadon, “DOE Budget Authority for Energy Research, Development, and Demonstration Database,” Energy Technology Innovation Policy, John F. Kennedy School of Government, Harvard University, February 29, 2012. 2011? Try current subsidies. We are well below $1 per kWh in 2013. where is the mention of inflation and real current money values? How much will the government spend to dismantle the Nuclear facilities and dispose of the waste? I’m starting to think the nuclear industry is paying people to write these articles. This is Fox News caliber. It’s easy to get the result you want when you only focus in on a short time frame, watch Fox News, they do it all day to distort the truth. Who to believe? Here’s the report from Nancy Pfund and Noah Walker titled “Ask Saint Onofrio: finding out what has been lost in the tale of two energy sources.” It triggered the usual suspects who provide content for PR Newswire, including this post. The gist of the report says basically the opposite – that over the past 50 years federal governmental investment in California energy is 4:1 for nuclear versus solar. With distributed and utility solar growing and nuclear wanning it kind of makes sense to have incentives from the government for the people. Plus people like solar. On the other hand, the problem with distributed energy is that there’s not a big pool of money left over from a single source to distribute to think tanks and such. Maybe California could levy a “think tank tax” on residents who install PV solar on their roofs. Not sure we can trust any journalists on this issue. Way over their heads and requires a lot of investigation that cant be done on the web. Give me a break, this is the same old card shuffle. You are looking at incentive per kWh of generation for a mature, established technology with a large established generation base compared to a developing technology in its early stage with a small (but rapidly growing) generation base. OF COURSE on a $/kWh basis the long establish technology receives a lower incentive. The purpose of incentives is to help develop DEVELOPING technologies to help them get to a larger generation base. You typically want to focus incentives EARLY in the commercialization cycle (when kWh is low). The fact that nuclear still receives such large incentive at this late date is a major strike against them. Meanwhile, it is clear that nuclear and fossil fuel technologies still take the lion’s share of incentives despite them being far past the commercialization stage where incentives are suitable.